The city of Beirut lies in the heart of the developing Middle East. Having always been a cosmopolitan city, it is a focal point of the region as a cultural and geographical link between Europe and the Middle East. The history of Beirut could hardly be more diverse; remains of Phoenician, Roman, Mamluk, Ottoman and Colonial rule have shaped the city and its buildings. 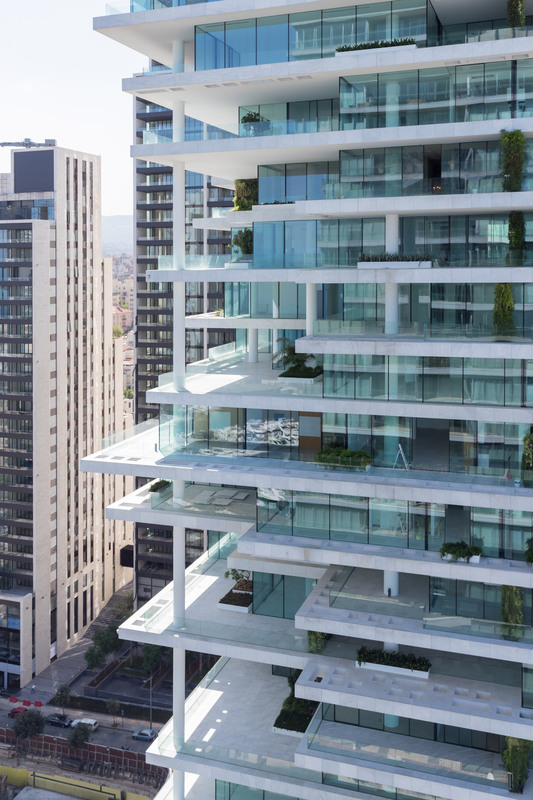 The design of Beirut Terraces was quite literally influenced by the layers of the city’s rich and tumultuous history.It is a history now also marked by inescapable traces of an eventful present. For generations to come, the people of Beirut will remember the assassination in 2005 of Prime Minister Rafik Hariri, when a car bomb detonated in front of St. Georges Hotel. The resultant devastation is still visible as a daily reminder. 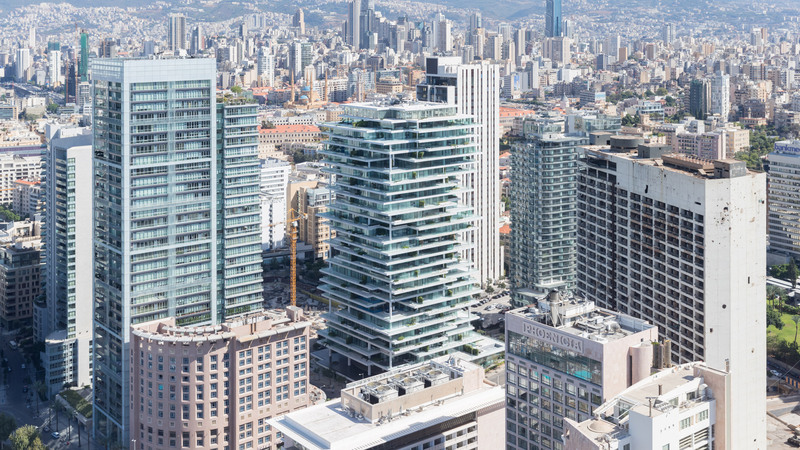 Despite a scarred history, there is a clear vision to rehabilitate the area, with a master plan well under way that aims to rebuild and revitalise this part of Beirut. 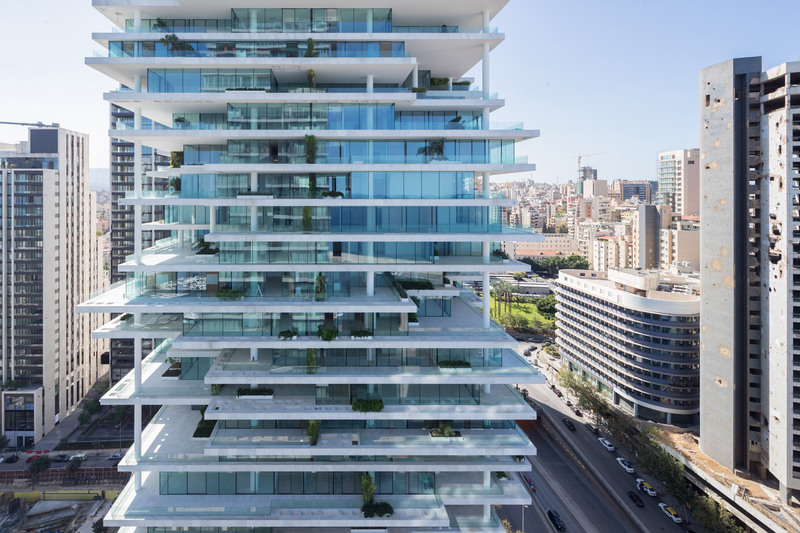 The site of Beirut Terraces is in a portion of the master plan dedicated to office and residential high-rise buildings, in the vicinity of a new yacht marina. The structure and appearance of the proposed building are informed with an awareness and respect for the city’s past, as well as the self-confidence and optimism of contemporary Beirut. Five principles define the project: layers and terraces, inside and outside, vegetation, views and privacy, light and identity. The result is a vertically layered building: slabs of varying sizes allow for interplay between openness and privacy that fosters flexible living between inside and outside. Fine detailing and a focus on the concerted orchestration of quality materials produce a structure that is both efficient and luxurious. Careful environmental engineering and specific use of vegetation further enhance sustainability and the quality of life within the building. The building is a multilayered 119-metre tall high-rise. The stratified structure is distinguished by projecting or set back living areas that generate terraces and overhangs, light and shadow, places of shelter and exposure. As a result, each unit is unique and variations in the layout of the apartments on each layer thoughtfully shape a new neighbourhood. The moderate climate of Beirut is undoubtedly one of the city’s greatest assets; it makes outdoor living an integral part of Beirut’s urban culture. The design therefore aims to cultivate this asset and incorporate it into the apartments. Indoor and outdoor spaces merge into each other so that the generous terraces truly become living spaces. The proposal for the vegetation blends in with the concept of the existing master plan. The idea of a green boulevard that connects the residential high-rise to its surroundings is taken up by the design and continued vertically both inside and outside the building. An expansive water feature in the main entry – a tall, airy, open space – is complemented by views of the sea to the north and the green boulevard to the east. 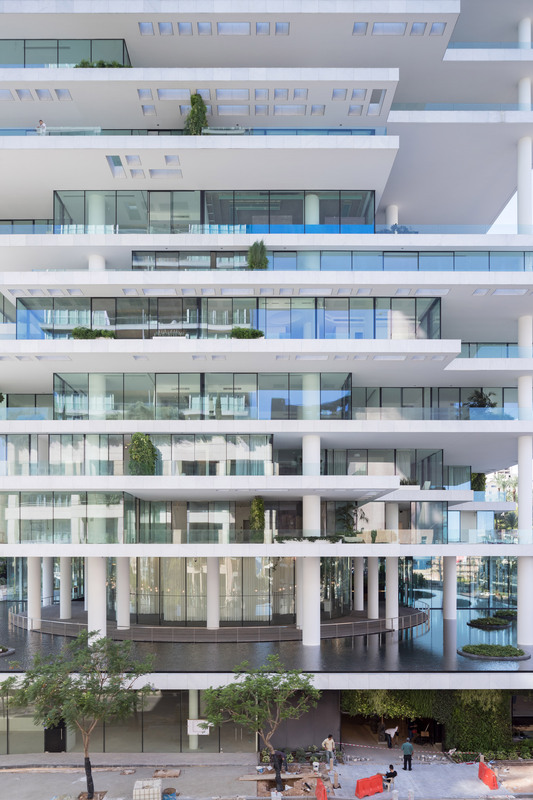 The interplay of architecture and nature that enlivens the spacious lobby around the central core is reiterated on the balconies and terraces throughout the entire building. The lobby thus forms a vibrant transition between the open, public landscape and private, green residences. 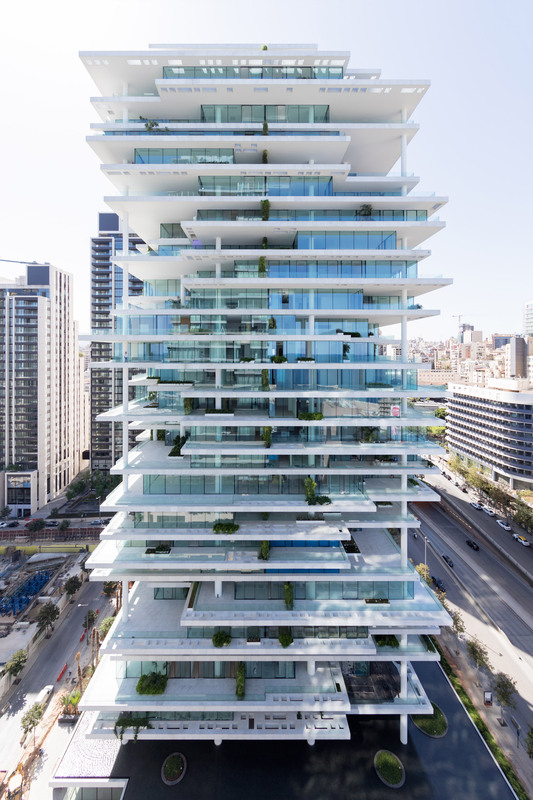 Being so close to the shoreline of Beirut, the building affords beautiful views of the sea. The vegetation on the terraces acts as a screen that not only provides shade but also ensures privacy for each apartment. Additionally, the building’s vegetation frames views and generates pleasant microclimates by tempering the immediate environment. Extensive overhangs provide shade and reduce solar gain. The slabs of each floor protrude around their entire circumference by a minimum of 60 centimetres, easing construction and maintenance of the extensive double-galzed façades. The floor plates are thick enough to balance the daily temperature cycles by virtue of their thermal mass, storing cold through the night and releasing it during the day. Such passive strategies make the building a truly sustainable place to live in. Where necessary, perforations in the overhangs modulate the lighting and exposure to the sun. Their density, shape, and the shadows they generate form a striking pattern that gives the tower a distinctive identity and sets it off from its surroundings. To guarantee sufficient differentiation of the building volume and maintain reasonable building ratio, the tower is made of five modular floors, repeated in different combinations. The structure is carried by the core and a regular column-grid that spans up to 14.7 metres. As a result the walls of the apartments are not structural and their arrangement is open to future flexibility. Each quarter of the tower has its own lobby with elevators serving no more than two apartments at a time. For greater efficiency, two lobbies share service elevators, MEP risers, and fire escapes. The mix of apartments of different sizes and types, including multi-storey duplexes, are distributed throughout the building, offering a variety of conditions to meet each tenant’s needs and provide each level with a unique identity. The apartments generally consist of three areas: a public reception area, a private living space, and a service area. The foyer and grand living room in the reception area include areas for seating and dining with access to a spacious viewing terrace. The private space features a family living room and bedrooms with en-suite bathrooms and walk-in closets and often also includes access to a terrace. The service area comprises a kitchen with storage and laundry room attached and a maid’s bedroom with bathroom. All the main spaces, such as living rooms and bedrooms, provide a clear height of 3.31 metres. Beirut Terraces provides amenities for residents at the entry level, such as a generous spa with pool, sauna, steam and massage rooms and shopping facilities along the eastern boulevard. Vehicle access and parking is separated between visitors and residents. Visitors enter by car from the north to parking on a lower level. Residents enter through a gate at the south on street level to a circular driveway, where passengers are dropped off at the main lobby. Ramps flanking the driveway provide direct access to secure underground parking levels.